Hoisin-Glazed steak with grilled vegetables and salad. I imagine many families will be gathering around the outdoor grill this weekend to celebrate Father’s Day. Whether Dad is the one doing the grilling or you’re the one grilling a meal for him, this quick and easy way of cooking steak results in a piece of meat that is tender, juicy and full of flavor. Along side it on the grill lay some of your, or his, favorite vegetables and you will have most of the meal at your fingertips. While the grilling is taking place, have someone on kitchen duty making a salad to go with it, and before you know it everyone will be sitting down together to celebrate Dad in the best possible way. The glaze on the steak calls for hoisin sauce, ginger, and fish sauce, giving it an Asian flair, so I kept that theme going in the meal I prepared by using green and yellow squash, brushed with a little sesame salad dressing as they cooked. For a salad I made cucumbers and radishes dressed with rice vinegar, sesame oil, and soy sauce. The recipes for making this complete meal are given below.Whether you make all of it or only part of it, I think you will enjoy it as much as we did. 2. Combine hoisin and remaning ingredients ( except steak) in a small bowl. Brush half this mixture on one side of the steak(s). Place steak glaze-side down on the hot grill rack and grill about 5-7 minutes. Lay steak on the grill glazed-side down. Brush top side of steak with remaining glaze mixture and turn steak over. Grill another 5 -7 minutes or until desired degree of doneness. Brush top side of steak(s) and turn over. 1. Slice the squash lengthwise into 1/4-inch thick slices. Brush both sides of the squash with the salad dressing. Squash slices on the grill. 2. Place squash slices directly on hot grill rack or use a fine mesh cooking screen if squash is in danger of falling through the grates. Cook squash, turning over several times, until nicely marked and just fork tender. Squash cooked on the grill gets lovely grill marks on it. 1. Combine vinegar, sesame oil, and soy sauce in a medium bowl; add cucumber and radishes. Sprinkle with parsley or cilantro and salt. Toss gently to coat. Would you believe I have spent all summer (until now) without a gas grill? How is that possible you might ask? Ours simply refused to light when we took it out of storage in the Spring. My husband took it all apart, cleaned all the parts, refurbished the burner with new parts, put it back together and it still wouldn’t work. Dang! So while everyone else was having their cookouts, or talking about the great foods they cooked on their grills I was feeling totally left out, not having anything to contribute to that conversation. 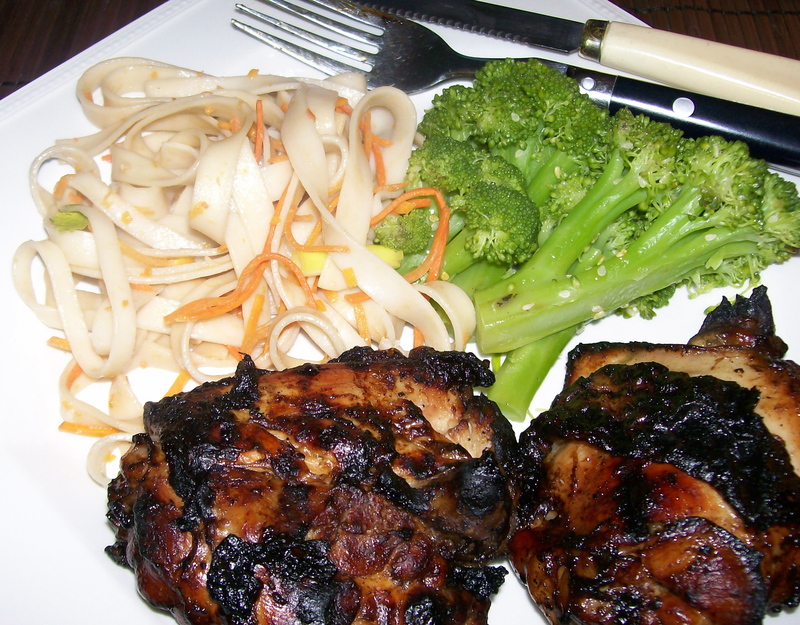 My post today is about my first real effort to cook something a little jazzier on the grill; Glazed Chicken Thighs. 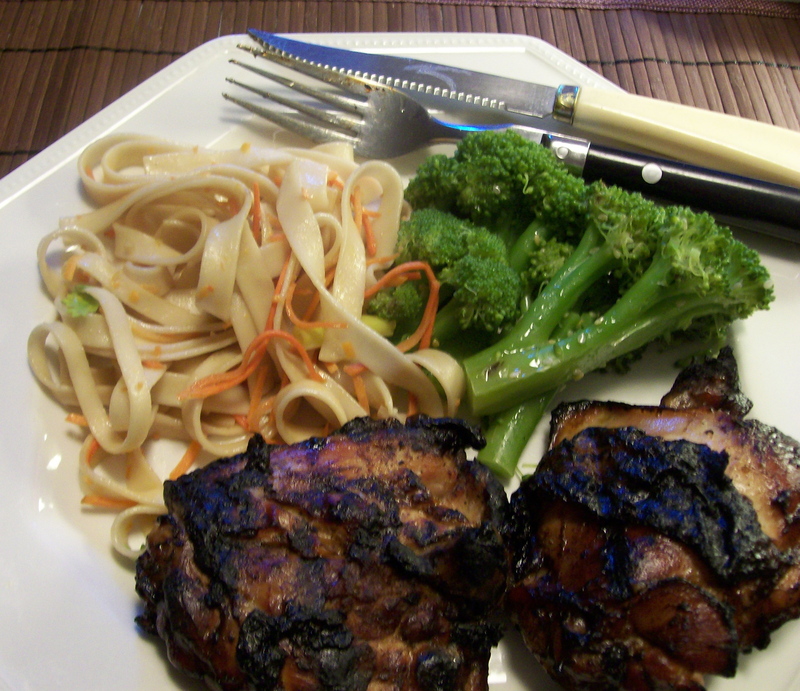 Since the recipe for the chicken contained some ingredients found in Asian cuisines, I paired it with another recipe I had for Szechuan Noodle Salad, and also included Sesame Broccoli. This, then, is my complete menu. It can be prepared in about 30 minutes. While the grill is heating coat the chicken in the glaze mixture. Grill the chicken. Keep the chicken warm in a low oven, and cook the noodles and steam the broccoli. Season the noodles and broccoli and serve. 2. Combine fresh ginger, hoisin sauce, lime juice and olive oil in a large bowl. Add chicken, toss to coat. 3. Place chicken on grill rack coated with cooking spray. Grill, about 4 minutes/side or until done. Remove from grill, cover and keep warm. The chicken could also be cooked indoors on an electric grill, or on the stove-top in a grill-pan. 4. Cook noodles according to package directions. Drain well. Combine Szechuan sauce, peanut butter, soy sauce, and lime juice in a large bowl, stirring with a whisk. Add noodles, carrots, and green onions; toss and serve with chicken. 5. For the broccoli: Add water to a saucepan to a depth to 1-inch. Add broccoli florets, bring to a boil and simmer for 4-5 minutes until crisp-tender. Place broccoli in a medium bowl. Add the sesame oil and sesame seeds, kosher salt and black pepper. Toss well. SOURCE: Cooking Light for both Glazed chicken thighs and Szechuan noodles.